Please click on any of the titles below to read the story. Images of the woman who may become the first Native American saint were unscathed in storm-damaged Camillus and at St. Lucy’s. The story of my healing that happened at the Fonda Shrine in the summer of 2006. The following are excerpts from a letter received from a disable Vietnam veteran concerning his encounter with Kateri. Thank you, Mr. Coppola for your most interesting account. Kateri Is Off To The Vatican! 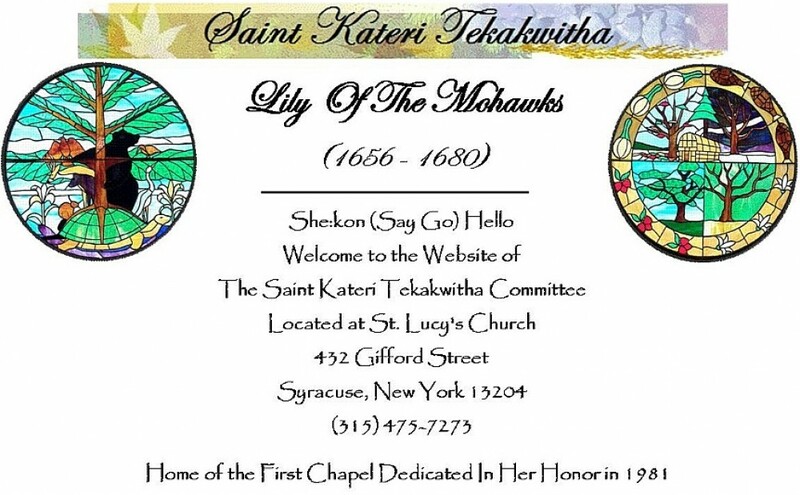 Word has been received that Monsignor Paul Lenz, Vice Postulator, has submitted the Cause for the Canonization of Blessed Kateri Tekakwitha to the Vatican. While many miracles attributed to Blessed Kateri have been submitted to the Vice Postulators over the years, they have not passed the intense investigation required to ascertain authenticity. Having reviewed a miracle for over a year and submitting this documentation, Monsignor Lenz, must truly believe in the merit of this miracle. We can only hope and pray that prayers said for the Canonization of Blessed Kateri Tekakwitha after a period of 329 years will finally be heard.. Thank you Jesus, MISSION ACCOMPLISHED!